The year of the Pig is a big money-maker for you, the Ox, and your financial situation is about to improve exponentially! Yours is a hard-working earth sign, responsible, independent but good-natured and the year of the Pig brings lots of money-making opportunities! Think of it as water to fertilise the earth and bring you lots of financial rewards for your long hard labour. You will enjoy this year more than you have any in a long while. Your career will grow and also bring financial rewards. What’s more you are finally surrounded by people who appreciate your talents, celebrate your achievements and want to see you succeed. This is a lucky year for you so make sure to save some of that wonderful wealth for the future. Make sure to take care of your health too and not work too hard. 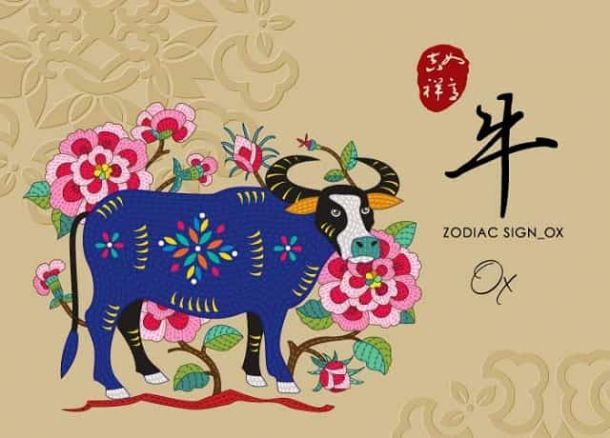 Love for single Oxen: The Pig brings you luck in love and this could be the year the you find your ideal love companion! Make sure to attend lots of social activities. You’ll find that you’re the main attraction! Others are drawn to you and this is the time to take the initiative. This year could bring an important new love relationship. Love for coupled up Oxen: This is the year to make your relationship official. Why not celebrate your love with an engagement or marriage? You might even crown your love bond with the birth of a child in the year of the Pig. It’s a sweet year for coupled up Ox, when relationships are fulfilling. Year of the Pig Forecast for you: The Pig brings you career luck and great money making opportunities, as well as happiness in love. Go for gold!